Rev. 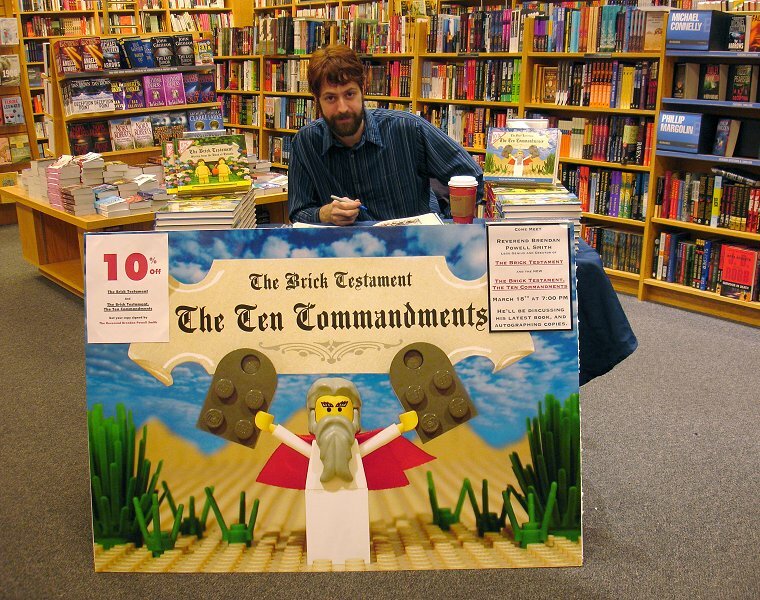 Smith’s latest book, The Brick Testament: The Ten Commandments is featured in the latest issue of Stuff magazine in their Hit List section, under the heading “Best Combination of Toys and God’s Wrath”. In other press news, an interview with Smith has been published in The Des Moines Register this week in which the right reverend discusses his fascination with Bible stories and weighs in on whether or not he considers himself “blasphemous”. Finally, the Ten Commandments was briefly written up in a recent Seattle Times article on new book releases. To help promote sales of his latest book, The Rev. Brendan Powell Smith is sponsoring a contest whose winner will receive an all-expenses-paid night on the town with Rev. Smith himself. To enter, simply purchase a copy of The Brick Testament: The Ten Commandments, and submit a photo of yourself and the book to thereverend@thereverend.com along with an essay of 100 words or less about why you should be chosen. All entries must be received by April 5, 2005. No purchase necessary (you can borrow a friend’s copy of the book for the photo if need be). Chances of winning are 6,508,050,928:1. Void where prohibited. One entry per household. Actual cash value of date: $17.42. Those two words can only mean one thing: The Brick Testament website has been updated today with two new stories chronicling the careers of Israel’s second and third of the Judges, Ehud and Shamgar. (Yes, they are totally as cool as their names would imply.) And if you happened to have missed out on Rev. Smith’s Ten Commandments book signing event at the Borders Books in Sunnyvale, CA, this evening, just so you don’t feel completely left out, here’s a photo of Rev. Smith right before being ravaged by an onslaught of rabid Brick Testament fans. The Rev. Brendan Powell Smith can be seen on TV tonight in a brief and uncredited bit part in the Sci-Fi Picture’s original movie Mansquito. The chilling tale of an escaped convict who mutates into a half-man, half-mosquito and terrorizes a city stars Corin Nemec (Parker Lewis Can’t Lose) and Musetta Vander (a poor man’s Melinda Clarke from The OC). Smith’s role in the movie is that of an unfortunate hospital employee who finds himself in the wrong place at the wrong time, and is quickly felled by title creature. He approximate screen time in the movie is .75 seconds. Four new illustrated stories from the Book of Judges have been added to The Brick Testament website today, culminating in the story of Israel’s first judge: Othniel. While Othniel may not be a household name (forever overshadowed by his only-slightly-less-obscure older brother Caleb), he did accomplish some fairly noteworthy things in Israel’s history, such as marrying his own niece, and then saving his people from the eight years of slavery that God had angrily sold them into.